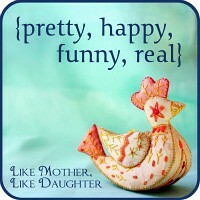 ~ Capturing the context of contentment in everyday life ~ Every Thursday, at Like Mother, Like Daughter! See more here. It's been a little bit quiet around the blog this week. I'm not entirely sure why. It felt like there was a lot going on, but in my current sleep deprived state I am at a loss to pinpoint just what we've been doing. Yeah. Riley and Abby made a lot of beautiful birds, of real and imaginary origins, to put on GrandBarry's lawn for his birthday. It's hard to see the detail but if you click on the photo it should open a bigger image. It was my dad's birthday this week. His age, I won't reveal. However, he says he is glad that he isn't at the stage that the character in this book is at! :) There is always a bit of good natured teasing around birthdays in our family. This is what happens when you the baby hangs out with the guys while Mommy is upstairs getting food ready. Sometimes the world is just so exciting it wears you right out! I admire babies for their ability to nap anytime, anywhere, and in the oddest of poses. Don't worry, I rescued him after snapping a few photos.